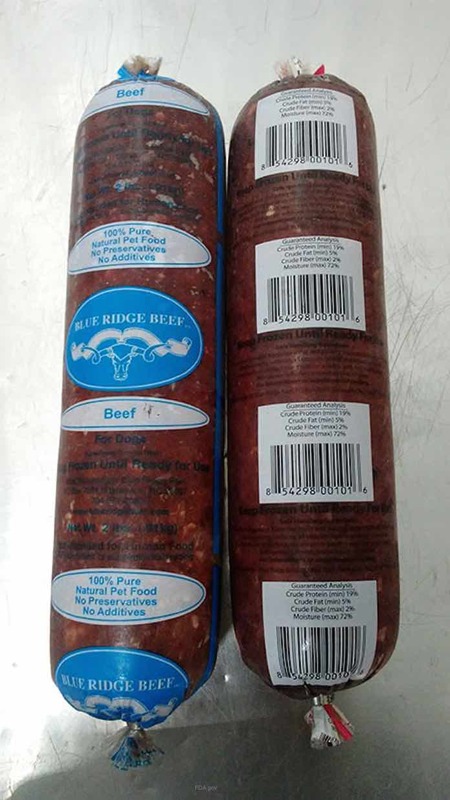 Blue Ridge Beef is voluntarily recalling two of its frozen pet food products because they may be contaminated with Salmonella and/or Listeria monocytogenes bacteria. Animals and people can get sick; animals from eating the product, and people from handling the product or petting sick animals. Two complaints have been associated with these products; one complaint of two kittens getting sick and one complaint of a puppy dying. The recalled products are sold in 2 pound chubs. 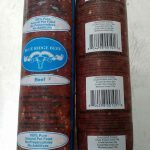 The first is Beef for dogs, with lot number mfd ga8516 and UPC number 8542980011009. The second is Kitten grind with lot number mfd ga81216 and UPC number 854298001016. The products were distributed to retail stores in North Carolina, South Carolina, Georgia, Florida, Arizona, and Texas. If you purchased these products, do not feed them to your pet. Throw them away in a sealed container or take them back to the state of purchase for a refund. Wash your hands well after handling these products. Then clean out your freezer or refrigerator with a mild bleach solution, since freezing does not kill Listeria monocytogenes bacteria. And that bacteria can grow at refrigerator temperatures. If your animal has been ill after eating this product, take her to the veterinarian. And remember that animals who have eaten contaminated food can shed the bacteria in their feces and that can get on their coats. Wash your hands well with soap and water after coming into contact with your pet. Then monitor yourself for the next 70 days for the symptoms of Listeria food poisoning. Those symptoms include high fever, stiff neck, nausea, abdominal cramps, and diarrhea. Also watch for Salmonella food poisoning. Those symptoms include nausea, vomiting, diarrhea, abdominal cramps, and fever. If you do get sick, see your doctor.